My Jaw Dropped is a solo exhibition of works by New York based artist Morgan Blair. This is Blair’s third time showing with us and her first solo exhibition with Left Field Gallery. The exhibition will include several of her uniquely painted canvases and new, wildly framed drawings. Blair’s paintings embody the pictorial equivalent of a crazy, collaged claymation movie with the color turned up to the highest frequency and the music blaring at an equal level. The play between hard-lined shapes filled with airbrushed color bands and texture-filled paint splotches is hard to visualize at first but once you’ve seen Blair’s work in person you quickly understand the singular dialogue she is speaking in. Morgan Blair (b. 1986, Worcester, Mass.) lives and works in New York. 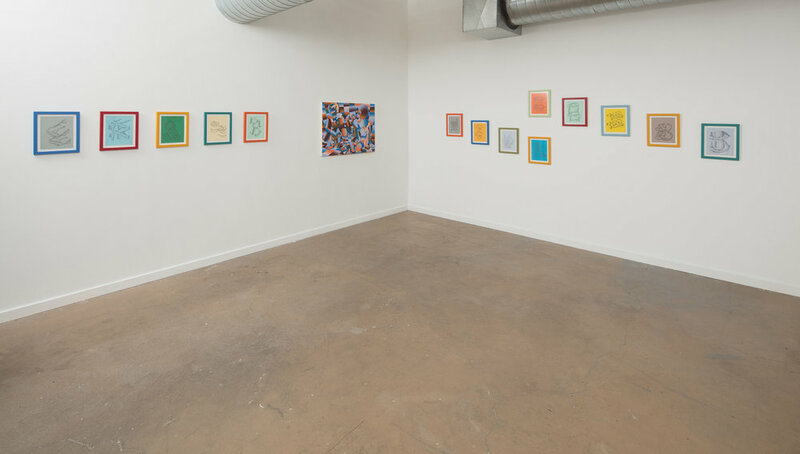 Her paintings have been the subject of a solo exhibition at The Hole in New York as well as a part of many group exhibitions which include those at Shane Campbell, Chicago; Andrew Rafacz, Chicago; The Newcomb Art Museum, New Orleans and Greenpoint Terminal Gallery, New York; among others.